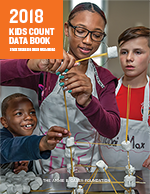 KIDS COUNT®, a project of the Annie E. Casey Foundation, is a national and state-by-state effort to track the well-being of children in the United States. By providing high-quality data and trend analysis, KIDS COUNT seeks to enrich local, state, and national discussions concerning ways to secure better futures for all children — and to raise the visibility of children's issues through a nonpartisan, evidence-based lens. DC KIDS COUNT is part of the network of local-level organizations in all 50 states, Puerto Rico, the U.S. Virgin Islands, and the District of Columbia that provide a community-by-community picture of the condition of children. The network organizations also monitor budget and legislative decisions in the states and provide policy analysis based on evidence of what works for children and families. In 2014, DC Action for Children released the DC KIDS COUNT Data Tool 2.0. Its purpose is to visually provide data points that focus on the well-being of DC children and families, neighborhood by neighborhood. The indicators reflect DC KIDS COUNT’s child-centered and asset-focused framework. Presenting up-to-date indicators at the neighborhood level allows us to view both strengths and potential needs within our rapidly changing city. With this knowledge, we are better able to evaluate the areas where DC’s children live, play and learn.